The era of BSNL 4G plus solutions started in the market using MDO services, now here you will know how to connect BSNL 4G plus hotspot using mobile data offload functions to enjoy the unlimited 4G internet? Our India is on the verge of the transition from minute’s era to Megabytes era, and our Tele density in urban India and the average has caused a hundred plus percentage and that in rural crossed 50%, to grab the opportunity, BSNL proudly announced Mobile Data Offloading (MDO) service to mobile users of prepaid and postpaid services. To meet every growing need of customers for high speed data downloads, deployment of BSNL 4G plus Wi-Fi hotspots with Mobile Data Offload and Broad Fi is the solution. Read this tutorial to learn more about BSNL Broad Fi service. In any BSNL WiFi Hotspot location in India, the mobile customer can enjoy BSNL MDO service which offers three times faster internet speed than that of 3G, and BSNL 4G Plus invocation using MDO services would be quite simple with user-friendly activation process on smartphones (Android and iPhone) and also, Tablets with SIM of any make compatible with Wi-Fi standards. Without getting late, let’s start about BSNL 4G Plus hotspot and how it used with the option of MDO services. 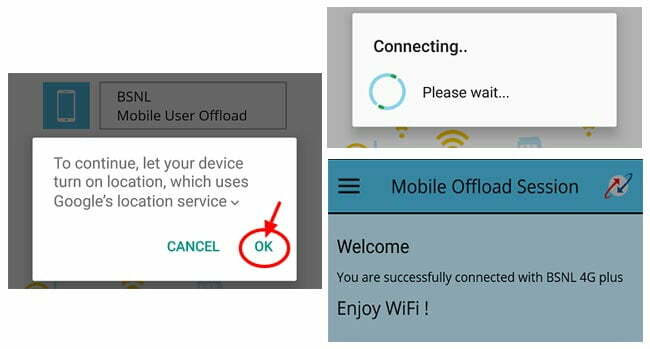 What is BSNL Mobile Data Offloading (MDO)? Technically speaking, It means, BSNL mobile users can access wideband WiFi channels instead of narrowband 3G channels, It is possible at the location of BSNL 4G WiFi hotspot for getting three times faster speeds than 3G to enjoy the unlimited 4G internet. Mobile Data Offloading(MDO) enables seamless migration of BSNL 3G data customers to continue using the service when enters into BSNL 4G plus WiFi hotspots, and the MDO service is not available on the mobile network, where it is a separate service link with BSNL 3G enables the user to have very high speed internet at BSNL 4G WiFi hotspot covered area. BSNL 4G plus offers fastest Internet experience to a user than 3G with same 3G data packs. Did not use any individual packs for 4G WiFi, can use only 3G packages. Faster movie downloads within minutes at BSNL 4G WiFi hotspot. It creates better download experience with Facebook, Whatsapp Videos, Larger Images, and Twitter, etc.. Ultimate faster access with Government services portals and more. Why BSNL Mobile Data Offloading (MDO) introduced? Since many years, BSNL prepaid customers and postpaid users using mobile broadband with 3G data packs, After the beginning of iPhone era and with complete digitalization, laptops, and tablets launch with mobile data broadband capabilities, data consumption goes to peak and the data speed is the major criteria. So, the Mobile data offload is one of the priority things among mobile operators globally, and BSNL is the first TSP in introducing Mobile Data Offloading (MDO) services in India, It is an alternative to 4G, and called as 4.5G, because it offers enhanced data speed than 4G services. First of all, you have to download BSNL 4G Plus Mobile App, and It is an MDO application for seamless WiFi for internet access without any 4G WiFi dongle or hotspot devices, You can download from Android play store for Android devices or from iTunes for iOS devices. After successful installation of the BSNL MDO app in your device. Enable WiFi on your device. Open BSNL 4G plus and click on BSNL Mobile User Offload. Let you open a pop window by asking you to continue to turn on your location from Google’s location service. Click on OK for BSNL WiFi sign in. You will show the connecting status in a pop window. 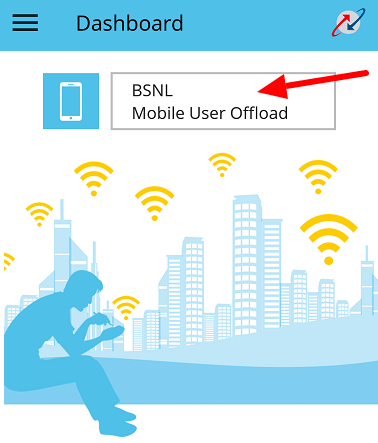 BSNL Mobile Offload Session automatically comes to final status and upon successful completion gives you a welcome message as “You have successfully connected to BSNL 4G Plus”. IF you got an error for not connecting, follow the steps from the starting to join again. After successful establishing of WiFi connection using BSNL MDO, you can check the bandwidth and settings as follows. Open your WiFi in your mobile settings. Click on BSNL 4G Plus which you have shown as connected status. You will get the signal strength, security type and IP address of the secure BSNL 4G WiFi hotspot connection. Authentication mode for EAP Method as SIM. Here you can see the other info on BSNL 4G Plus in the form Frequently Asked Questions (FAQs) and answers, Have a look at all of them to connect an unlimited 4G internet. Without application can I use BSNL mobile data offloading service? No, you can’t connect to BSNL 4G plus using MDO service. It will connect and calculates the data usage of your 3G data subscription. Are there any individual packs require to subscribe for using this service? BSNL mobile customers can use their existing 2G / 3G data plans subscription to connect seamlessly using BSNL 4G WiFi hotspot to enjoy three times greater speeds. If I have BSNL 3G Unlimited Plan can use at these hotspots? Yes, you can happily connect 4G plus using BSNL unlimited data plans or combo vouchers which already subscribed and use 3G data as the unlimited 4G internet. What are the charges for using this BSNL 4G WiFi hotspot if not subscribes to any 3G data pack? If not subscribed to any combo or Noncombo 3G data packs, your prepaid account balance will deduct at 10Paise per 10KB. It is applicable for your total usage(download/uploads). How to know the BSNL hotspot location in a town/city in India is? 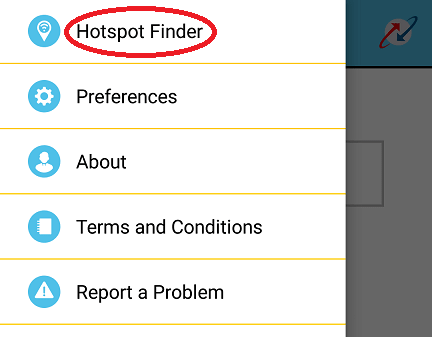 Select Hotspot Finder to locate BSNL 4G hotspot. You will display the total list of BSNL 4G Plus hotspot’s available near your visited location. Can other network customers will use this MDO service? BSNL 4G Plus using mobile data offload service can use only by the present BSNL mobile customers. The total billing would be done as per the subscription of 2G/3G data packs of prepaid or postpaid services or from the balance if not subscribed to STV’s/Addon’s. Are there any APN settings for this BSNL 4G Plus? 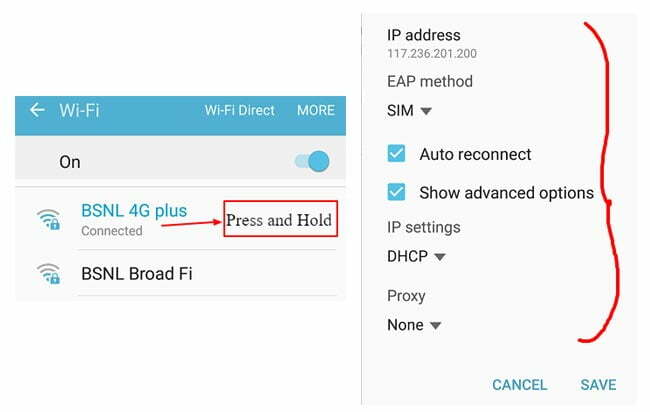 APN for BSNL 4G plus hotspot is not required here, and separate APN for BSNL 3G also not required to install, the only direct connection allows at hotspot coverage area, and it is a new service but links with BSNL 3G data usage for billing. With this complete tutorial now you know about BSNL 4G plus and how to activate this using BSNL 3G data subscription, also how to find the hotspot location at your visited area, So just move on to BSNL 4G Plus App download to enjoy the unlimited 4G Internet service at your location.